The Trump administration’s recent flurry of trade moves is spiking uncertainty and confusion among financial markets. His imposition of tariffs on steel and aluminum as well as levies on Chinese imports have provoked immediate reactions. China, for example, claims that the United States’ actions are a violation of international trade rules and threaten to take actions to defend its national interests. While Trump administration officials view the ensuing chaos caused by America-first trade moves as a necessary price of doing business in a global economy, other politicians, pundits and the financial markets appear concerned that a trade war is being provoked. The financial markets are reacting negatively to this news because history shows that trade wars rarely end well for the stock market. Earnings and valuations for companies that are not linked to international trade will most likely not be impacted. The problem, however, is that concerns over a trade war can shift overall stock market sentiment, putting everything at risk. Within 24 hours of President Trump’s announcement of the tariffs and levy announcements, stocks across the globe declined over fears of escalating trade tensions. The accompanying table illustrates the impact on worldwide markets. Source: DataStream, March 23, 2018. Past performance is not a guide to future performance and may not be repeated. 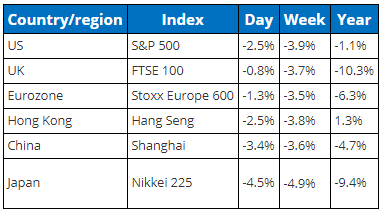 Asian markets suffered the most, primarily over concerns that Japan could get caught in a United States versus China trade war. This is coupled with the fact that the Japanese yen is considered by many to be a safe haven and will rise in any flight to safety. When the value of the yen is pushed higher, Japanese exports become more expensive. Europe and the United Kingdom were the least scathed. In addition, a subsequent announcement indicated that the EU, Mexico and Canada will be temporarily exempt from the new steel and aluminum tariffs. Yields on government bonds – including 10-year U.S. Treasuries – declined, which caused prices to rise. The yield spread widened on the Corporate bond market as the difference in yields versus equivalent government bonds increased. What’s Driving the Market Reaction? China retaliated on news of U.S. tariffs by unveiling plans to charge tariffs of their own on more than 100 U.S. products, raising concerns of a full-scale trade war. Trade-war fears are causing investors to worry about the impact on corporate earnings, especially within cyclical sectors. These concerns follow on the heels of a period of rising growth and a positive future outlook, as in January when the International Monetary Fund upgraded its forecast for global growth by 2 percent. The IMF now projects up to 3.9 percent growth in both 2018 and 2019. The Chinese Ministry of Commerce’s plan to increase or add tariffs to 128 U.S. products represents an approximate $3 billion economic impact. At the same time, China’s U.S. ambassador noted that his country is not interested in starting a trade war, reiterating the Chinese believe in free trade. Some believe this is China’s way of indicating a willingness to engage in negotiations. Furthermore, China could potentially entreat the World Trade Organization (WTO) to open a case against the United States or limit the procurement of services provided by U.S. firms to state-owned and government entities. Potential Market Impact of a Full-Blown Trade War? If history is any guide, we know that trade wars are not good for markets. Many historians believe, for example, that the Great Depression of the 1930s was either deepened or lengthened by protectionist policies. More recently, in 2002 President George W. Bush announced steel tariffs of up to 30 percent (exempting Mexico and Canada). The European Union threatened but never enacted retaliatory measures; however, they did open a case with the WTO. In December 2003, the WTO ruled against the United States, causing the U.S. to drop the tariffs. The impact on the U.S. dollar and markets was negative but muted, due to the short duration and quick resolution of the matter. Overall, the main concern of investors is on the potential for a long and protracted trade war with China that could drag in the rest of the world. This would cause a global slowdown, impacting earnings and growth and creating a downward cycle that forces the markets lower.